I made a little which helps you create a HTML-Version of your Library. You can then save the tools generated files in your dropboxs Public-Folder (or anywhere else on the web) and show it off to your friends. You can find all information on http://movielist.wbbcoder.de. How does it work? Download the correct version, start it, enter the IP of your XBMC-machine (and the port if it differs from 80) and there you go. As soon as the tool detects XBMC it will start fetching the data. Currently, the tool creates a folder out in your users directory. Existing folders with that name might be deleted, so check that before you run the tool. Please also note that this is a very early build and I only tested it under OSX with Gotham. Please let me know if it did or did not work for you and which version you are using under which system. This tool is made in a way so that it is easy to add your own output-themes if you like to. If you have a little experience in HTML, CSS and JS that is all you need to go. Just updated the tool to include the theme-selection. I would really really love to get more feedback! I tried out your little app, both Mac (Mavericks 10.9) and Windows 7 versions. 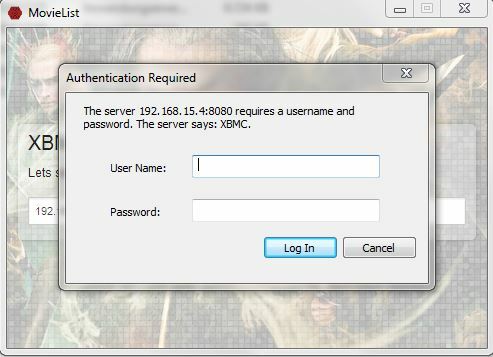 It seems there are problems with authentication to XBMC. On the Mac version after entering the ip address and port, a dialog to enter username and password appears for a second, then disappears again. So it is not possible to enter any credentials. On the Windows version, also a dialog shows up and I can enter username and password here, but after doing so, the program crashes. There is no authentication implemented in the tool right now. Do you mean the operating systems dialog? Maybe a screenshot would help.. It crahes after to press Log In. I wish to have Rotten Tomatoes (user+critics) + IMDB both ratings display in skin. Okay, my HTTP was not protected with any username or password, that is why I never tested this. If you like to, temporally disabling the credentials should (hopefully) resolve the issue. It works! Amazing job, took just 30s for ~200 movies. Looking forward for TV Show support. The interface can be improved here and there, but for now it is very decent. It was very quick to scan my library, less than a minute for over 600 movies. Start over option doesn't work, crashes with a "Uncaught node.js Error"
The "XBMC-Location" screen could do with a "OK/GO" type button and also some error trapping. I've been looking for something like this for a while but nobody can quite seem to get past an alpha like state, yours show great potential and I hope you can improve it with time. thanks for your detailed feedback, it really helps me! About the list-size: Yup you are right about that. Especially for big libs this does not work well. But that is where the underlying theme-system comes in play: I can do another version that fits exactly this need without changing the existing one. I already have something like this + a coverwall in creation. The sorting will be integrated by clicking on the col-headers. I have it in place in another template but with big libs it gets, for some bogus reason, buggy. I want to sort that out first. Yeah the file-info would be really great, but sadly I was not able to find these things in the JSON-API at this point. I'll put that on my list and ask the devs about it. That the search does not work is somewhat surprising to me. I never had any issues.. Could you give an example of a searchterm and its unrelated result? Support for TV-Shows is something I would like to add AFTER all other points are sorted out. I'd like to focus on movies first. Besides the named issues and 2 additional templates I will integrate something that scales down the images to what makes sense for the template and improve the overall stability. At least for me image-downloads will sometimes fail (about 1 in a 50), but that may be because of my personal network-setup. About the uncaught error for starting over: Hm.. seems like I did not update the builds I have on the website. It should be sorted out in the newer versions. Will do that later. Regarding the search, it appears to be case sensitive which is why I wasn't seeing the correct results. eg I could see "Star Trek" in my list but searching "star trek" returns no results.